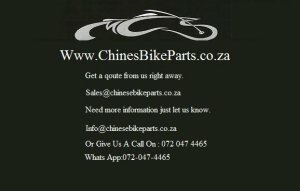 We do Chinese bike spares for most models. All parts can be couriered any where in South Africa Cdi Unit, ignition coil,2 wire relay, rectifiers, mirrors, indicators, regulator, throttles, clutch cables, throttle cables, scooter parts, chinese bike service, scooter service. For more info check our website or mail us.